Dunnottar Castle Stonehaven commands some stunning views as the Castle is situated right on the Stonehaven coast on a flat topped rock within the Mearns region. It is 160 feet above sea level. Takes a coach trip from Aberdeen to Dunnottar Castle. 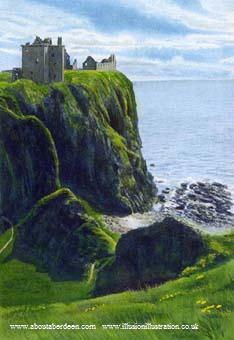 Dunnottar Castle was the stronghold of the Keith Earls Marischal. It is mostly ruinous now. It was built by Sir William Keith, Marischal of Scotland after the site changed hands between English invaders and a retaking by William Wallace and later Robert the Bruce. Dunnottar Castle Stonehaven had many famous and prominent names in history. These include Charles II, Mary Queen of Scots, William Wallace, St Ninian and the Marquis of Montrose. 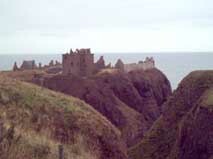 During Cromwell's invasion the Scottish Crown Jewels were brought to Dunnottar Castle in 1651. The Castle survived an eight month siege thus saving the Honours of Scotland (a 1.3 metre sword, crown and sceptre). In 1652 roundheads were eventually successful in their siege to the Castle. However they did not get their hands on the Honours - the state papers and the regalia were smuggled out of the Castle and hidden at Kinneff Church before the garrison surrendered. Dunnottar Castle Stonehaven never recovered from damage incurred during the siege and after its fall. It was then used as a military depot and barracks and then fell into ruin. It was then sold to the York Building Company who stripped it of any value. The estate was bought back by the Keith family in 1727 and later sold in 1873. The Castle and the buildings were not maintained. In 1925 Lady Cowdray was assisted by the architect Dr William Kelly in repairing the Castle. It is now owned by Historic Scotland and is open to the public. 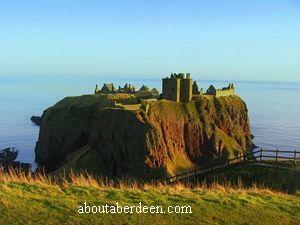 Dunnottar Castle Stonehaven was used as a filming location for the film Hamlet which starred Mel Gibson. Dunnottar takes its name from the Pictish word Dun which means the place of strength. 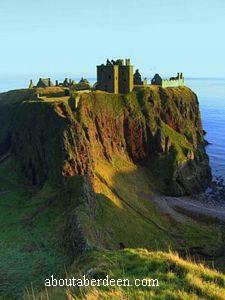 The original name of Dunnottar Castle was Dun Fother which meant the fort in the low country. 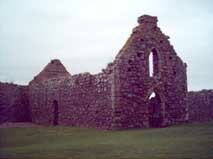 In the 4th Century St Ninian built a church in the area where the Castle would eventually be built. When Sir William Keith built Dunnottar Castle Stonehaven he faced excommunication by the Bishop of St. Andrew for building on the sacred rock. He escaped this punishment by paying a suitable fee to the Pope. St. Ninian later became the first Saint of Scotland. In his lifetime he built many churches through Scotland. The rock faces at Dunnottar Castle are nicknamed the pudding stone because the jutting out pebbles, rocks and stones looks like raisins in a fruitcake. 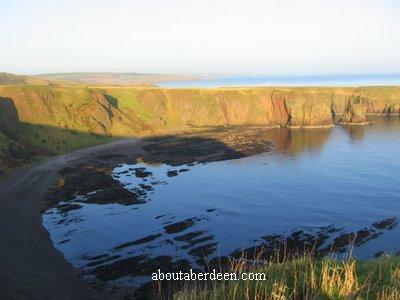 As you approach Dunnottar Castle Stonehaven there is what looks like a cave on the right hand side. This is a man made tunnel which takes you down to the cliffs. Please note there are sheer drops so children should be closely supervised. Heading back to the Castle takes you to some steps to the outer defences of the entranceway and portcullis with its nine metre high wall and parapet. Next comes the tower house. In the 16th Century another building, named Benholm Lodging was built. It was a favourite resting place of a member of the family and named after him. Next comes the remains of the guardrooms and prison cells. Another walk up steps brings you to the ticket booth. The guide there is a great source of local information and history. Though there is no guided tour they are happy to answer any questions and the guide book is a super resource to aid your visit. Your next stop at Dunnottar Castle Stonehaven takes you to the Quadrangle from where you have some commanding views around the Castle, Stonehaven, the cliffs and out to Sea. Though most of Dunnottar Castle Stonehaven is in ruins you can still walk up many of the staircases and enter various chambers and look up the huge fireplaces and into ovens in buildings such as The Keep and rooms such as The Great hall. Latrines, bedrooms and kitchens can be seen. Surrounding buildings include the Blacksmiths (Smithy), Storerooms, Stables and a Chapel. To the left is a large well like water storage area, which has steps down to it. 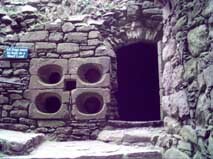 It is more like a cistern with water piped into from the mainland. It is thought to be over 7 metres deep. The Drawing Room and Dining Room at Dunnottar Castle Stonehaven has been renovated to imitate how it would have looked in the 17th Century. One large room of interest at Dunnottar Castle Stonehaven is the cellar below the Marischal's Suite which was called the Whigs' Vault. It was used as a prison for 122 men and 45 women who refused to accept the Episcopalian style of Church which King Charles II imposed upon Scotland. Conditions for them were grim, the cellar had no sanitation, was water logged and food and water was scarce. They were held from the 24th May until the end of July 1685. 37 finally took the oath of allegiance, 25 escaped, though 15 were captured and horribly tortured and 2 died during the escape. Five more died during their imprisonment. Those who would not sign were deported to the West Indies; 70 of them died on the voyage. The names of the 167 men and women are listed at the Castle in a room with other memorabilia including a scale model of how the Castle looked in the 17th Century. On the way out is the Lion's Den, so named because the Earl Marischal kept a pet lion here. It was short lived because its roaring kept the Countess awake so she had it killed. The Earl then took a bear as a pet! 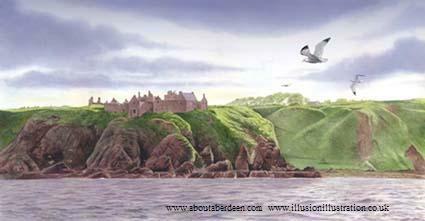 The ghost of a young girl dressed in a dull green dress has been seen in the brewery at Dunnottar Castle Stonehaven. She goes to the doorway next to brewery and disappears. The ghost of a deer hound has been seen near the tunnel. 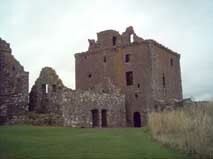 A tall Scandinavian ghost has been witnessed going into the guardroom at Dunnottar Castle Stonehaven. Noises as if from a meeting have been heard from Benholm's Lodging, though no-one has been seen. There is free parking near Dunnottar Castle Stonehaven. The walk down involves many steep steps and walking on a stony path. It makes the Castle unsuitable for disabled visitors, though stunning views of the Castle can be seen from the car park. There are toilets within the Castle grounds. The gents' toilet was used as a Sentry Box when the Castle was functioning as a stronghold. Some of the chambers in the tour of the Castle can be dark - bringing a torch is recommended. There are no cafe or food and drink facilities at Dunnottar Castle Stonehaven. Dogs are permitted in the Castle provided they remain on their lead. A comprehensive guidebook with photographs and pictures of Dunnottar Castle is available. It explains the function of each area you tour and the history and points of interest. There are pictures of how the Castle would have looked at its peak in the 17th Century. 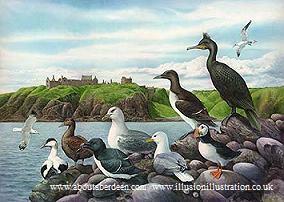 Please allow 1 - 2 hours time to view Dunnottar Castle Stonehaven, tour the grounds and take photos. The peaceful area surrounding the Castle is a haven for many birds and mammals including guillemots, razorbills, puffins, herring gulls, peregrine falcons, seals, dolphins and the occasional passing whale. The entrance fee is �4 for adults and �1 for children. Directions - From Aberdeen head towards the Bridge of Dee and follow the signs for the A90. Take the turn off to Stonehaven and follow the one way road, past the Golf Course and into the town centre. Go through the main street to the end and follow the road to the right. You should see signs for the Castle which takes you to a left hand turn and you can't miss seeing the Castle. Parking is on the right side. There is a foot path that takes you directly to the Castle and War Memorial. It is about a mile and a half walk and gives you some superb views of Stonehaven harbour and cliffs, ideal for photo opportunities. There is ample parking in the town centre. Read about the Stonehaven War Memorial and to view photos. On Sunday 1 July 2007 panoramic scenes of Dunnottar Castle shot from a helicopter were shown on the BBC 2 programme Coast at 8pm. The presenters of Coast (Neil Oliver, Mark Horton, Alice Roberts, Nicholas Crane and Miranda Krestovnikoff) were in Aberdeenshire for the fifth episode which explored the Scottish coast from Berwick-upon-Tweed to Aberdeen. They also featured the fast sailing clipper boats from nearby Inverbervie and interviewed the crew.